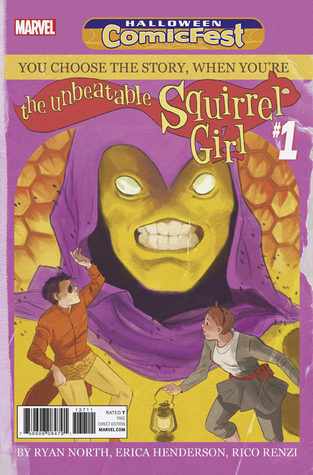 Comics Trade Round-Up: Squirrel Girl, Hellcat, and more! This is super-delightful. I never read the original Runaways series, but I am rather proud of myself that I recognized some of the characters. Set during the events of Battleworld, Runaways follows first year students at Victor Von Doom's Doom Institute, a sort of Hitler Youth training ground, but just substitute "Von Doom" for Hitler. At the end of each year, there is a final exam that's done in teams, but because Jubilee and Sanna got into a massive hallway fight involving ice shards and extreme mayhem, they're in detention. Which means they're going to miss the final exam. Thankfully, Amadeus Cho, totally still a superhero with his geeky powers, overwrites the robot teacher's programming, and the students make it to the test on time--only to discover that they are teammates. This does not go well. It gets worse when Jubilee's best friend and ex-girlfriend, Pixie, is eliminated. It gets even worse than that when Amadeus slips them into an unused portion of the battle game and they discover that all of the students who die in the exam die in real life. 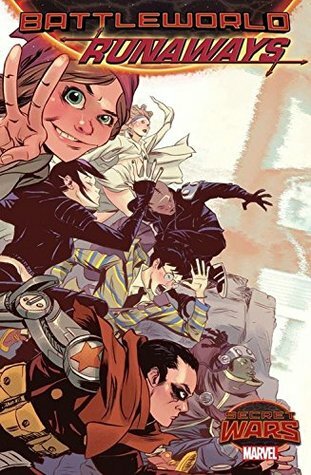 Now on the run from Valeria Von Doom, the diminutive headmistress, and ever-faithful, ever-so-not-taking-a-joke Bucky Barnes, a rule-following senior, the Runaways must a) survive and b) let everyone at the Doom Institute know what's really going on. The banter is snappy, the relationships are realistic, and the action scenes are frantic and full of energy. 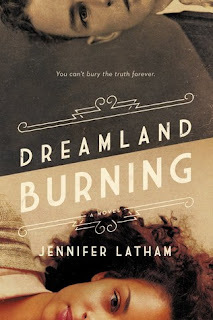 I have to say, I'm kinda hooked. This trade also includes some issues from Secret Love, and the amazing short by Jeremy Whitley (author of Princeless!!!) featuring Misty Knight and Danny Rand is included. It's just ... it's perfect. I love it. This is not a drill! This is a CHOOSE YOUR OWN ADVENTURE Squirrel Girl comic involving a man made out of bees that he psychically controls. Ergo, it's amazing. My brother gave this to me a few months ago and I just got around to reading it. Whoops! If you can find it, read it. It will make you happy in these dark, dark times. Because a) squirrels, b) puns, c) Deadpool trading cards, and d) CHOOSE YOUR OWN ADVENTURE OMG!!! I'm not sure when or why, exactly, I became a Kate Leth fan. It may have been when I decided that the majority of my favorite comics writers and illustrators (and prose authors, for that matter) are Canadian, and I followed a bunch of them on Twitter. 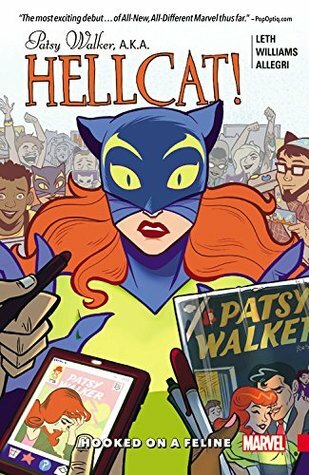 I went into Hellcat knowing zilch about the character, but Leth does a fantastic job of writing Patsy so that you don't feel hampered if you're a newbie. This comic is extremely fun, nicely referential, and wonderfully illustrated by Brittney Williams. Times are economically tough for She-Hulk, and Patsy is let go as a private investigator for the legal firm. This also means she needs to stop sleeping in the storage unit that she has appropriated for her home. Patsy ends up rooming with an Inhuman named Ian, whom she had previously talked down from pulling off a bank heist. Patsy's really good at turning sort-of-inclined-to-bad Inhumans into helpful and nice Inhumans. But! As she walks around New York City, everyone seems to know who she is. As it turns out, her childhood friend ("friend"?) 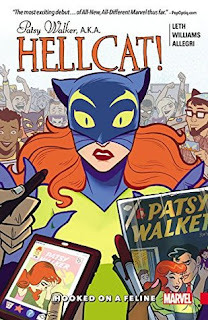 Hedy Wolfe has republished the old Patsy Walker comics against Patsy's wishes. Can you imagine walking around with everyone knowing you as the star of a teen romantic comic book series? That sounds worse than whatever Patsy had to deal with while in Hell. I would like a Hellcat/Squirrel Girl team-up comic, please and thank you. The effervescent Ms. Marvel series gets dragged into Marvel's Secret Wars event, but Wilson handles the end of the world with grace and heart. As Kamala Khan faces the end of the world, what decisions will she make? 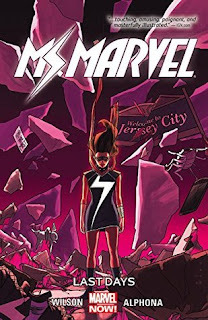 With her personal hero and mentor Carol Danvers at her side, Kamala tries to fortify Jersey City against the coming apocalypse. 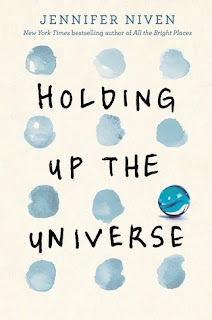 But when there's a giant planet hurtling toward the Earth, there's not a lot she can do to fix things. There's an extremely touching scene between Kamala and her mother, and the ending is the perfect mix of sadness and hope. Really lovely.